The response to Babe was so strong, she just had to make a second appearance. And she does, literally coming together again in the wilds of Queens to face the shifty Shrewmanoid and his legion of giant cyborg alligators! Up from the depths of the sewers and out of the pages of Monkeyman &amp; OBrien comes this cantankerous creature crew! 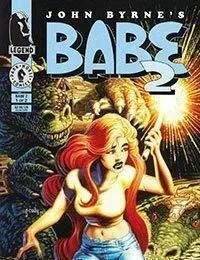 Will the bodacious Babe halt the musty menace before civilization as we know it is in dire need of a bath?